This post is an introduction to PrestaShop smarty cache. This is a tip for a beginner PrestaShop owner or developer. Smarty is PHP template engine, with smarty, you are able to separate business/program logic from your GUI design(theme or template). PrestaShop utilize smarty engine so that you are able to switch/change your PrestaShop theme easily. The theme files (GUI design) are saved in separated themes folder, and with .tpl file extension. But in order to make your theme file work, it has to be compiled into native PHP file before your web server can render page HTML contents to your browser client. Compiling the themes file will reduce your server performance. In order to minimize the performance influences, PrestaShop uses smarty function so that the compilation is done only at first time of usage of theme file. As mentioned above, when smarty cache is turned on, the compilation will only be done at first time use of the theme file. That means when you make changes on the theme file, the new change you applied to the theme file will not be in effect. By default, the smarty cache is turned on after you install your PrestaShop. If you do not know there is a smarty cache is in action, you may not know why your changes on theme file does not reflect to your PrestaShop pages. 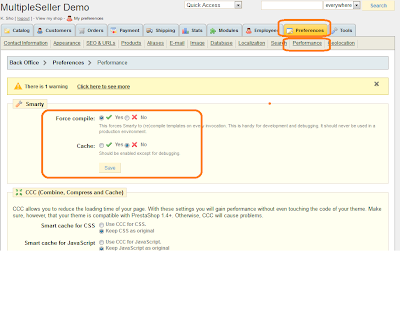 If you want to make changes and test the changes, you will have to turn off the smarty cache temporary. If you are using PrestaShop 1.4x or higher, you don't need to changes file directly, you can make changes from you back office directly. switch the smarty cache on or off and click "Save" button"
It is highly recommend to leave your smarty cache on if your store is in production or you are not making any changes to any themes files. 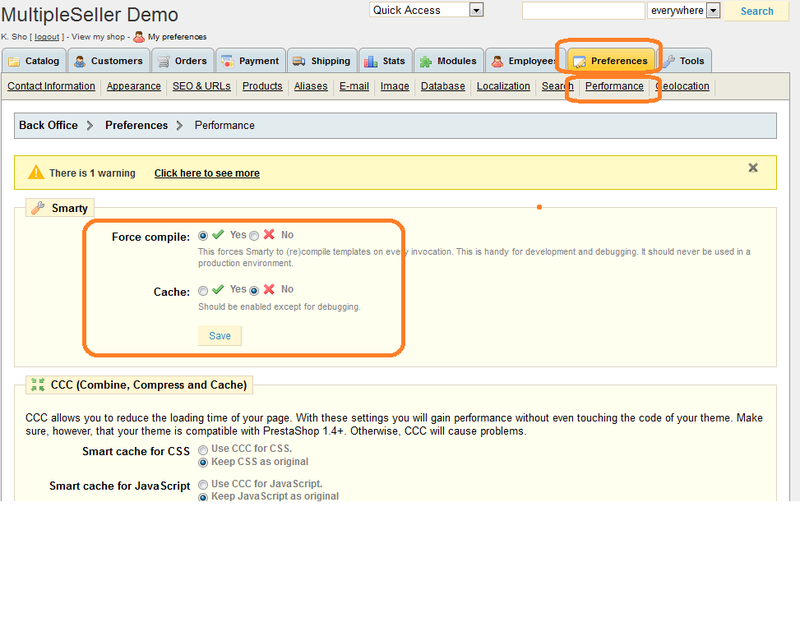 This will rapidly improveyour store performances.